pediment that coincides with the 400 m threshold elevation. This signifies an anomalous uplift at the rifting phase. clearly owes their origin to the rifting architecture of the AS at the Red Sea extensional margin. the south; but it is widest at its middle (about 700 km). a crustal thickness of approximately 42 km (refer below). present study area (Figrue 1). the gravity traverse location is shown. Figure 2. Anomaly-elevation scatter plots for the study area. tion threshold 400 m at the base of the Asir Mountain. 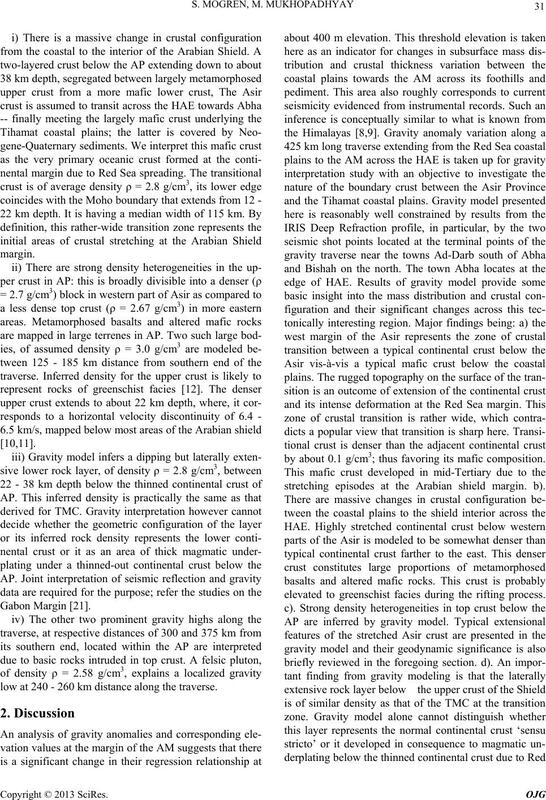 analysis and shear-wave splitting studies [15*, 16**]. juncture [10, 11] developed during rifting. 300 and 375 km from southern terminus of the traverse. the lowest misfit to observed Bouguer anomalies . the present case (Figure 3). basic and felsic rocks [17,20]. calculated gravity in red colour. low at 240 - 260 km distance along the traverse. by about 0.1 g/cm3; thus favoring its mafic composition. 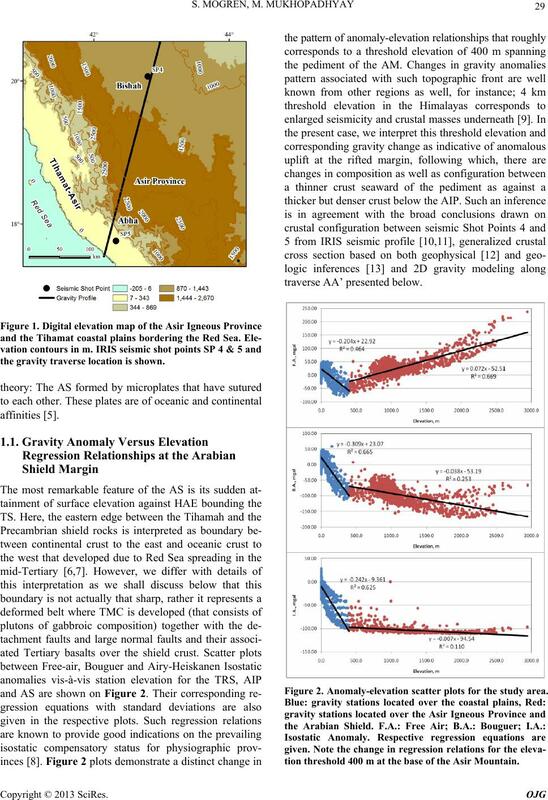 stretching episodes at the Arabian shield margin. b). elevated to greenschist facies during the rifting process. consensus view on Red Sea spreading for the region. for the boundary crust and the deformed belt. owing to their intimate relationship to Red Sea extension. Chemical Geology, Vol. 226, 2006, pp. 163-188.
of Amrica, Bull, Vol. 95, 1984, pp. 913-921. Deputy Minist. Miner. Resour., Jiddah. of America, Vol. 96, No. 7, 1985, pp. 817-826.
casting,” Maurice Ewing Series, Vol. 4, 1981, pp. 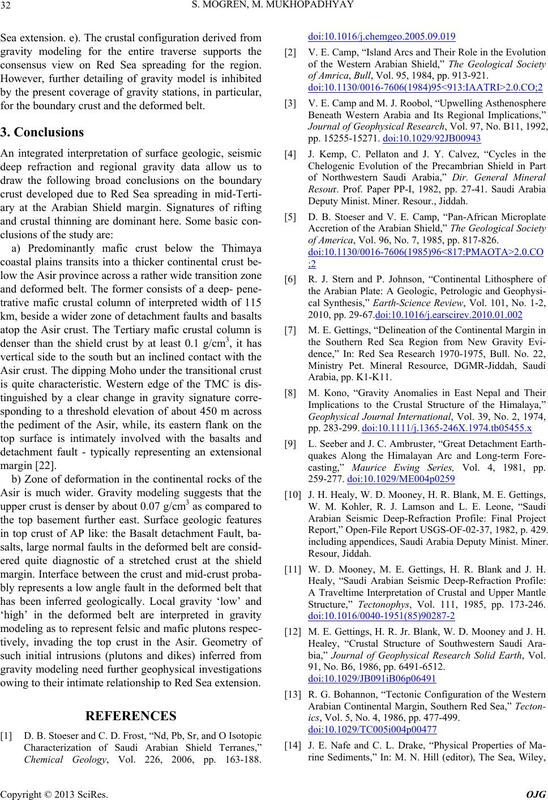 Report,” Open-File Report USGS-OF-02-37, 1982, p. 429.
including appendices, Saudi Arabia Deputy Minist. Miner. W. D. Mooney, M. E. Gettings, H. R. Blank and J. H.
Structure,” Tectonophys, Vol. 111, 1985, pp. 173-246. 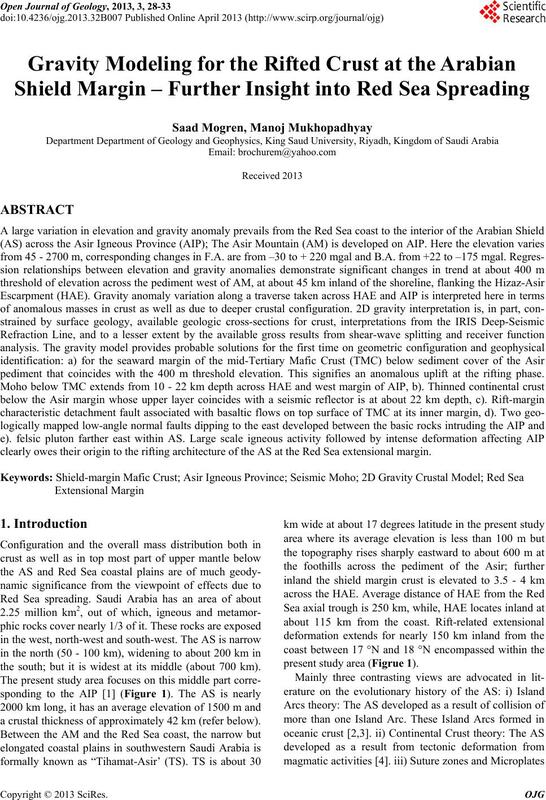 M. E. Gettings, H. R. Jr. Blank, W. D. Mooney and J. H.
bia,” Journal of Geophysical Research Solid Earth, Vol. 91, No. B6, 1986, pp. 6491-6512.
ics, Vol. 5, No. 4, 1986, pp. 477-499. N. Y., Vol. 3, 1963, pp. 794-815.
physical Research Letters, Vol. 26, No. 6, 1999, pp. M. R. Kumar, D. S. Ramesh, J. Saul, D. Sarkar and R.
Vol. 29, No. 8, 2002, pp. 831-834. Research, Vol. 114, No. B12, 2009. Geophysical Research, Vol. 49, 1981, pp.101-107. 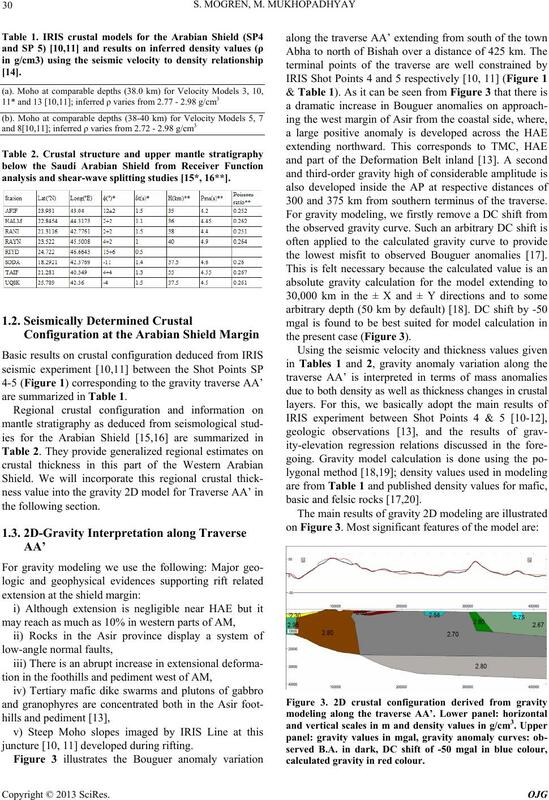 Gravity Data,” Tectonophys, Vol. 506, No. 1- 4, 2011, pp. 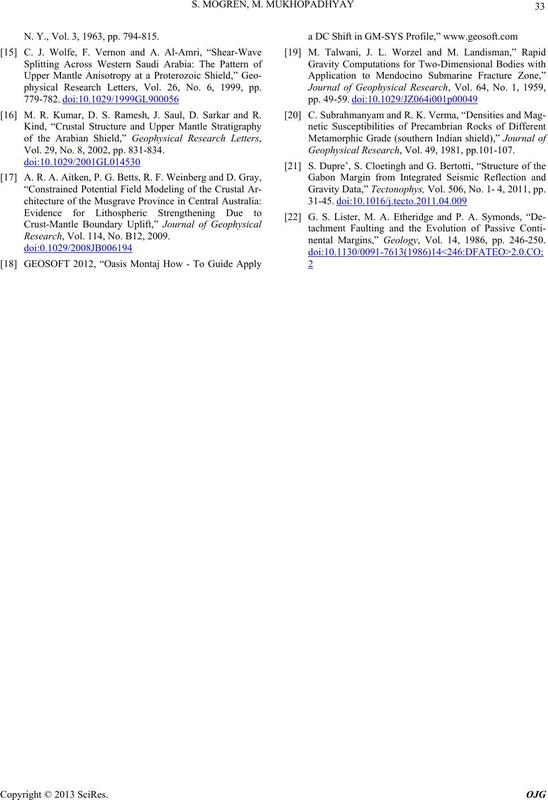 nental Margins,” Geology, Vol. 14, 1986, pp. 246-250.